In August of 2018 the International Association of Blacks in Dance Inc. (IABD) posted an online call for support within their membership pool entitled Keep Dance Alive. The damages, devastation, and loss due to Hurricanes Irma and Maria forced establishments like the Music in Motion School of Higher Dance Education in St. Croix, US Virgin Islands to start anew. It was Jan Newcomb and her response team who reached out to IABD Special Programs Assistant Carol Foster after having visited the site. Much of its equipment, merchandise, and infrastructure had been ravaged by the storm. 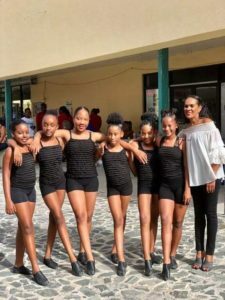 When IABD President and CEO Denise Saunders Thompson caught wind of it, the Keep Dance Alive call was put out along with a list of items needed to help them fully recover. 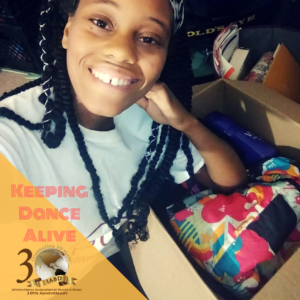 In immediate response, Dance Scholar and Community Leader Kayla Harley setup a donation drive among local dance schools, studios, and programs in the Washington, DC metropolitan area. Within a few short weeks, four enthusiastic supporters, Grace Johnson of Neema Dance Collective, Amanda Standard of Divine Dance Institute, Sabrina Taylor of Supreme Productions and Company, and DaKiya Lambert of Dance Dimensions, joined Harley in her efforts to Keep Dance Alive by donating items to be sent overseas. The items included dancewear, leotards, tights, dance shoes, pants, skirts, African cloths, costumes, dance bags, and a dance character plush toy. Although Harley did not have a vehicle of her own, she managed to collect and store large boxes at her home in Maryland until it came time for delivery. She carefully coordinated days and times with Ms. Foster to get the boxes to the IABD headquarters and was delighted to discover that they had a special Emergency Response fund set aside just for instances like this to cover the costs of international shipping. In the end, President Thompson stretched herself wide, muscling the boxes for the USVI to the post office for shipment. Harley is grateful for the expedient response and participation of fellow dancers, including an anonymous Good Samaritan who saw Harley stumbling into a building with the boxes and offered the use of his trolley. As a token of her gratitude, she created a video narrative describing, Keeping Dance Alive featuring those involved. Visit the link, see it for yourself! By October 8, the Music in Motion School of Higher Dance Education had received its giant boxes of Love and Humanitarianism. The Keep Dance Alive story reached the St. Croix Sourceand was featured on the USVI radio show It’s your Perspective, where Music in Motion Director Charlita Schuster shared the exciting news of support “from the States” as she put it. Thanks to these generous efforts and contributions, Ms. Schuster’s students will begin a new season this fall called Get Up Off of That Thing and Dance, with more than enough supplies for class, rehearsal, and performance for ages 3 -22. Kayla Harley is a Dance Scholar, Performing Artist, and Mentor. Her professional career in dance has gone full-circle to the DC metropolitan area where she serves the community as a GYROKINESISⓇ Master Class Teacher and as a choreographer throughout the U.S. The article “Donations Keep Music in Motion School Moving Ahead” appears in The St. Croix Source here. The Performing Arts Readiness project supports a variety of programs to increase the knowledge and ability of performing arts organizations to create and execute emergency recovery plans. Funded through a grant from the Andrew W. Mellon Foundation. © 2019 LYRASIS. Except where otherwise noted, content on this site is licensed under a Creative Commons Attribution 4.0 International license.